In the late 1970s, Marvel had a clever idea for a concept to introduce – the Cosmic Cube, as part of a research center program called Project Pegasus. And where better to do it but in a series that wasn't considered a flagship series per se? 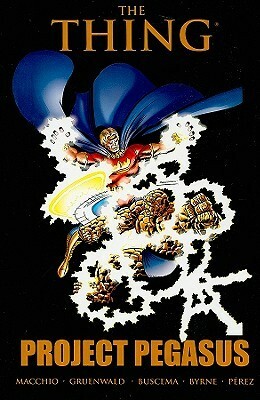 The story takes place in the first book the Thing (Ben Grimm) got that was close to but not actually a solo book (that would come later in the form of The Thing solo which succeeded MTIO), and it began with a young alien Ben befriended, Wundarr, being taken for experimentation at the project center. This outraged Ben so much he broke in with the initial intention of busting him loose. Captain America was there and convinced Ben he was on Wundarr's side as well, and observing the tests to make sure the alien guy wans't being abused. But as can be expected, things go awry when an infiltrator steals the Cube for his own megalomanical schemes, a cult leader type called the Entropic Man. After causing plenty of chaos, he flees to the Florida Everglades swamps, with Thing and Cap in hot pursuit. Fortunately, who should help them out in the end but the Man-Thing, who happens to be nearby, and winds up touching the Cube in a way that freezes the villain, rendering him more like a statue. A number of issues later, Ben returns to the Project Pegasus headquarters, where Wundarr's still being held for research, but it's exceedingly difficult to do, because much of the electronic equipment shuts down whenever in the guy's vinicity. And elsewhere, the supervillain Solarr is trying to bust Klaw out of the prison where he's being held in the Pegasus facility. And as if that couldn't make things complicated enough, Thundra's been duped into infiltrating the complex with some Femizons. It all makes for a most exciting adventure right within a relatively confined area, and Ben gets guests and help from Quasar and the second Giant-Man (and former Black Goliath), Dr. William Barret, among others. And this is what led to the introduction of the Cosmic Cube in the MCU. Sometimes, the best ideas come in the smaller titles, and that's how you can really prove inventive. So if you ever find this story, give it a try. It's a great example of Bronze Age genius. Copyright 2018 Avi Green. All rights reserved.